The Bay Cabin or Number 1 has a windowed porch that opens up to a big living room space. Off of the living room is a dining room that looks out at the lake and a separate kitchen area. There are 4 beds and 3 bedrooms. The bathroom comes with a bathtub/shower. The Little Cabin or Number 2 has two bedrooms, a living room, kitchen and dining area, a porch and a bathroom with a shower. The first log cabin has a screened in porch that looks out at Island Lake. This cabin comes with a small living area, a kitchen, 2 bed rooms and a bathroom with a shower. The Frame Cabin or Number 4 Comes with a porch that looks out at the lake. A Living area/Dinning Area, a kitchen, 3 bedrooms and a bathroom with a shower. The Third Log Cabin or Number 5 is tucked away for more privacy. It features a screened in porch, small living room/kitchen/dinning area. Two Bedrooms and a bathroom. This cabin does not have hot water. Showing facilities are available at the main office house. The Beach Cabin or Number 6 is home to the resort's beach. The beach area is open to all guests of the resort. The cabin features a big porch, that opens into a living/dinning area with a kitchen. There are two bedrooms in this cabin and a bathroom. This cabin has only cold water, so showering facilities are available at the main office house. The Hill Cabin or Number 7 is up a hill from the beach cabin. This cabin has a large porch that opens into a small living/dinning area complete with a kitchen. There are two bedrooms and a bathroom. This cabin only has cold water. There are showing facilities available to guests at the main office house. The Point Cabin or Number 8 is located on an island with a man made road leading to it. 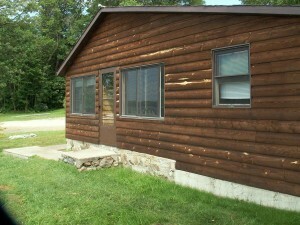 This cabin features a big screened in porch a living room area with dinning room, a kitchen, 3 bedrooms and a bathroom. This cabin does not have hot water. There are showering facilities at the main office house.